Samsung India today expanded its Duos lineup with two new additions – Galaxy S Duos (S7562) and Galaxy Y Duos Lite (S5302). Both phones feature dual-SIM functionality and support Smart Dual SIM that allows users to take calls from SIM 2 even if the SIM 1 is active. On the specs front, Galaxy S Duos comes with Android 4.0 OS, 1GHz processor, 4-inch WVGA display, 5MP and front-facing VGA camera, Wi-Fi, Bluetooth 3.0, 4GB internal storage, microSD card slot, GPS, 1500mAh battery and apps like ChatON, My Movies, My Music, My Education and Handy. Samsung has priced Galaxy S Duos at Rs. 17,900. Galaxy Y Duos Lite is pitched as the first smartphone due to its affordable price tag. The phone will go for just Rs. 6,990 and will come with Android 2.3 OS, 832MHz CPU, Wi-Fi, Blutooth, GPS, 3GB internal memory and microSD card slot up to 32GB. Galaxy Y Duos Lite users will also be eligible for 1GB of 3G or unlimited 2G data for first six months on Reliance. 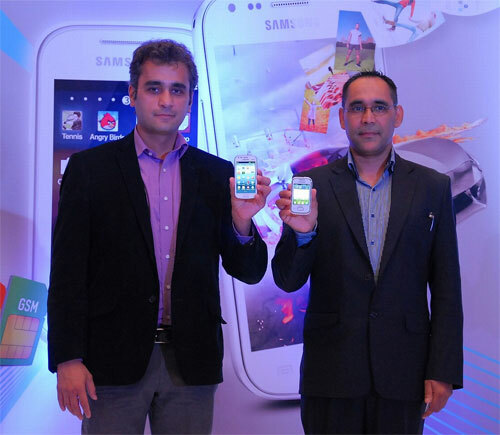 is galaxy s duos is available in delhi right now……..